Health education is at the heart of what we do. We connect the community with the services they need, teach them about how to improve their health and equip them with the tools to maintain their health throughout their lives. Through the senior satellite center at Casa Maravilla, we see more than 1,600 people per year. Many of our older adult patients have led difficult lives and thus have specific needs. We give them an outlet to channel their energy in a positive way. Our seniors express themselves and their culture through painting, poetry, dance and theatre. We like to think we do more than heal the body. Through our services at Casa Maravilla we strive to nurture the soul. The senior program is built on top of a solid foundation of fitness promotion. The senior fitness program takes place every Monday, Wednesday and Friday. 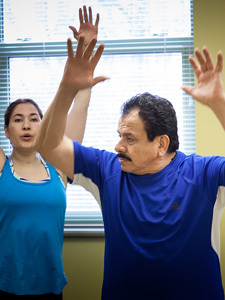 Our Fitness Plus and Fit and Strong programs keep seniors active, and they are guided by instructors who know how to design a program to fit the individual. Instructors evaluate their physical capabilities and train them to use the fitness equipment safely. Our Lifelong Learning program includes computer classes, as well as many other physical activities, such as dancing. Danzón, line dancing and Mexican Folkloric dance are particular favorites. Our meal program provides lunch Monday through Friday. We maintain partnerships with such renowned institutions as the Chicago School of Professional Psychology, University of Illinois, Rush University Medical Center and the Spertus Institute for Jewish Learning and Leadership. Through our community senior advocacy work, we help people understand government benefits, programs and services for which they may be eligible but lack awareness. Community members can receive routine screening services, such as blood pressure screenings, at Casa Maravilla. Most patients have a primary care physician at Alivio Medical Center or elsewhere, and we complement these services by working with them on a personal level. We promote disease self management and make services such as flu shots and cancer screenings a regular part of our recipients’ lives. We communicate with our seniors regularly, and we welcome them to come to us for answers to questions about health maintenance and prevention. For more information on health insurance click here.